This large stone and brick barn is one of a number of historic farm buildings, some of which date back to the 1500s. It is situated in an idyllic setting on the outskirts of Rookley village, in a valley amid farmland and woodland, only reached down a farm track, half a mile from the road. It is however within ten minutes drive of the County town of Newport, with large, modern shops, cinema, pubs, restaurants, etc., together with more traditional farmers' markets and old style stores. The town is largely level, with good wheelchair access to most premises. Several local pubs and restaurants have excellent facilities for disabled customers. 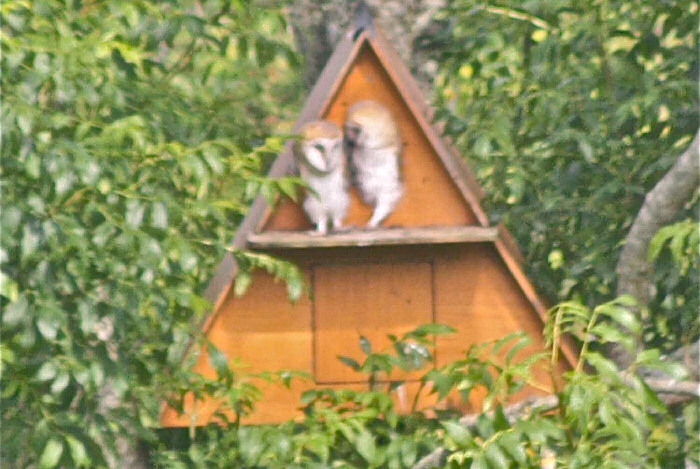 For those interested in wildlife, in addition to our resident colony of red squirrels, we have been delighted this summer (2012) to have had barn owls nesting in the garden nestbox (see photo). Visitors to the Red Barn have enjoyed a clear view of them each evening as they emerge from the box and fly around the grounds. Views from all directions are beautiful, and offers peace and calm. The building is warm and welcoming, with comfort a priority. We are now offering hot tub hire - please contact us for details. Listen to Ian Mac from Vectis Radio talking with Sarah Starsmore from The Red Barn.